Today we celebrate the biggest day in professional football, the Super Bowl. Many will gather with friends or family to watch the two most deserving teams square off in a quest for the Lombardi Trophy. There will be food, drink and lots of really, really costly commercials - some of which will make us laugh, others that will make us go Hmmm...and maybe one or two that will shock us. And while it is a nice diversion from all that is going on in our country, it pales in comparison to what we experienced as a family yesterday. Those of you on Facebook know that my son Ben swam his final meet as a senior at Waukesha South High School yesterday. It was the Junior Varsity Conference meet which is a playoff amongst all the teams in the Classic 8 conference. 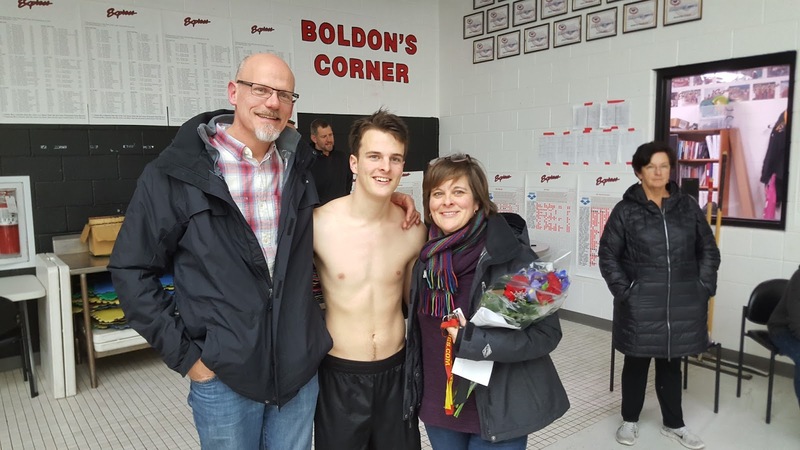 Going into the meet, his goal was to simply "break 30," or in layman's terms, to better his time in the 50 Freestyle and come in at less than 30 seconds. Ben joined the swim team last year as a junior and to his credit has had nothing but a positive experience with it. He loves being on a team, especially in a sport where you are striving for personal bests in the name of helping the team do better overall. To further complicate achieving this thirty second goal, Ben has been sick for nearly a month and his battles with a sinus infection have made his quest a season long struggle. So as we sat up in the stands, I said a little prayer that he not only break 30 seconds, but that he break it by a couple of seconds. His first event was the 50 backstroke as part of a relay, a race he wasn't on the program for, but swam anyway. He did a great job, but it was just a warmup for things to come. When he came up for the 50 Freestyle, I was a bundle of nerves. As they took off, he was neck and neck for the first 25 yards. He seemed to be thrashing and kicking with a bit more vigor than I've ever seen. After the turn, he inched ahead and ended up touching the wall at a time of 28.27 seconds. Ben looked up at the clock and fist pumped. A personal best by almost two seconds! I was filming the whole thing and if you watch, the audio portion tells the story. The whole race - even though it was heat #7 of 11 heats in a JV race - nearly brought me to tears with pride. I was so stinking proud of him as well as super happy for him achieving something he'd set out to do. Well, later in the day he went on to better his 100 yard freestyle by 11 seconds. Then he swam a 50 freestyle as part of a relay and bettered his time again, this time swimming a 27.85. It seemed that by achieving his first goal, his confidence boosted so much that the others came more easily. Sports are like that sometimes. I mention this event not to boast about my son. Yes I am proud of him, this day spoke more to me about the good things that a sport can do for a person. One of the things Ben missed during his Freshman and Sophomore years was not being part of a team. He'd played football up till then and, despite not playing much, he loved being part of a team. So when he joined swimming, he was back with his tribe, so to speak. I know that feeling and can speak to it from my own high school experience. I played football, soccer and ran track during my freshman and sophomore years, but dropped all sports after that. I loved being on a team, but because I was small, I didn't get enough playing time to keep my interest as a junior. In a sense, this was Ben's Super Bowl of swimming. And while I'll enjoy the game today, it doesn't hold a candle to watching my son swim his heart out. These are the moments we latch onto and hold close to our hearts. In my eyes, right up there with Desmond Howard returning a kickoff for a touchdown, you have Ben Landwehr swimming hard to the wall.